I’ve mentioned before that muffins are my favorite baked good to whip up. 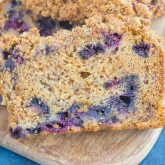 I love the ease of preparation, the endless varieties, and the fact that muffins are a great grab ‘n go option for a quick breakfast, snack, or even dessert. And now that it’s almost back-to-school time (YIKES! 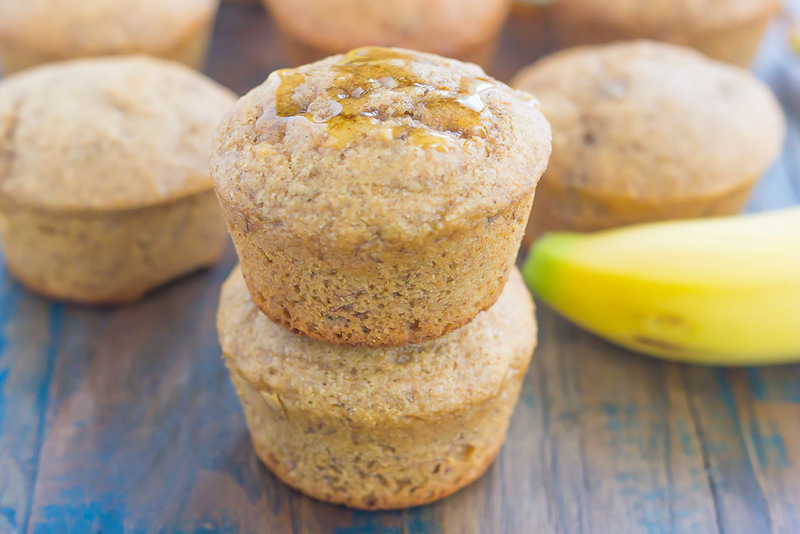 ), I thought these Healthier Banana Honey Muffins would be perfect for those busy mornings. You know, when you’re rushing to get the kiddos out the door, have to get yourself ready for work, or at least have to be able to function in the mornings. Those are the busy mornings that I’m talking about. Or, if you’re like me and don’t have kids, you wake up needing all the coffee and a quick breakfast to fuel you up. 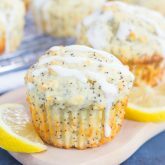 Yep, these muffins are perfect for you, too. And if you’re like me, you might just have all of the ingredients in your kitchen to make these babies. If you’ve been hanging around here long enough, you know that the hubster loves bananas. But, he’s picky about them! He won’t eat them with any brown spots on them (even though the browner, the sweeter). So, that means that I eat and bake with a lot of brown bananas in our house! And guess what? The browner, the better for baked goods, friends. 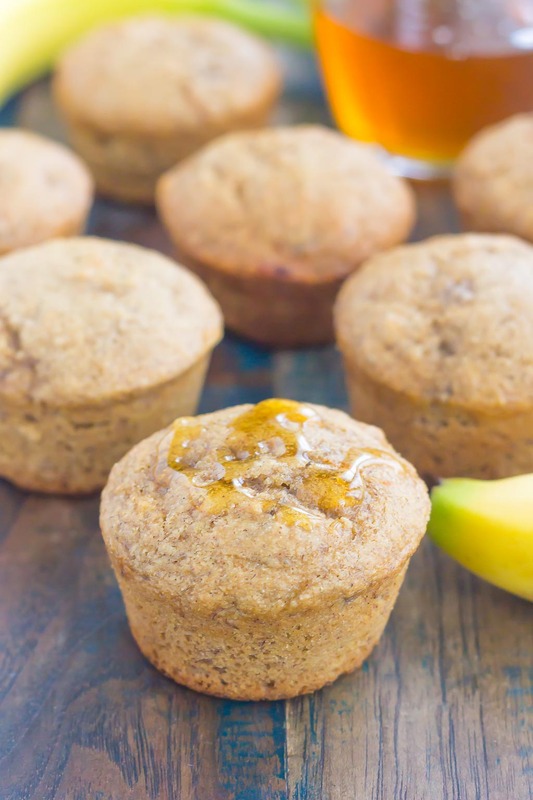 Especially these Healthier Banana Honey Muffins. 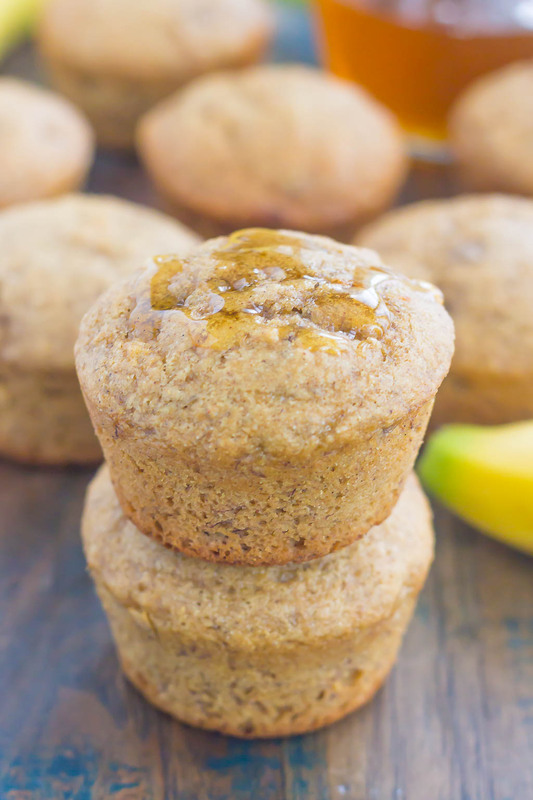 These muffins are made with whole wheat flour and just a bit of brown sugar for extra sweetness, plus a good helping of honey. 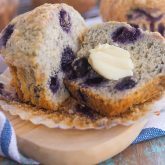 It gives these muffins just a touch of sweetness, without being overly sweet or sugary. 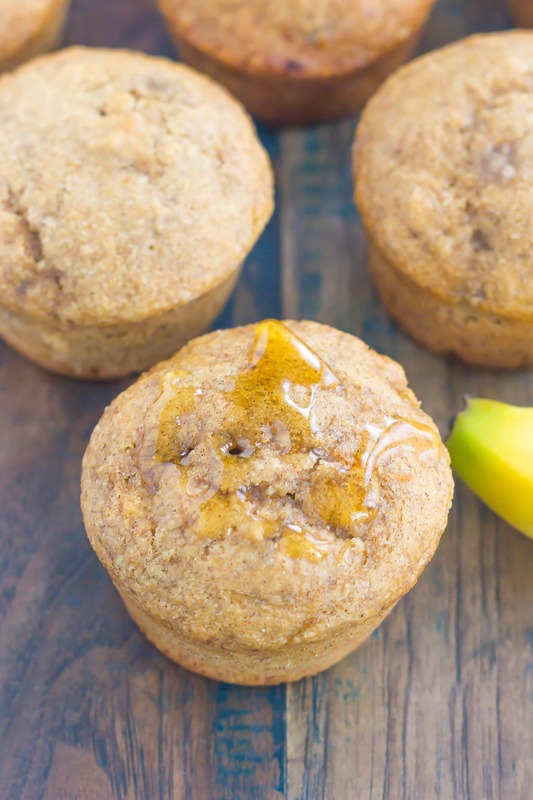 These Healthier Banana Honey Muffins bake up soft, moist, and filled with better-for-you ingredients. 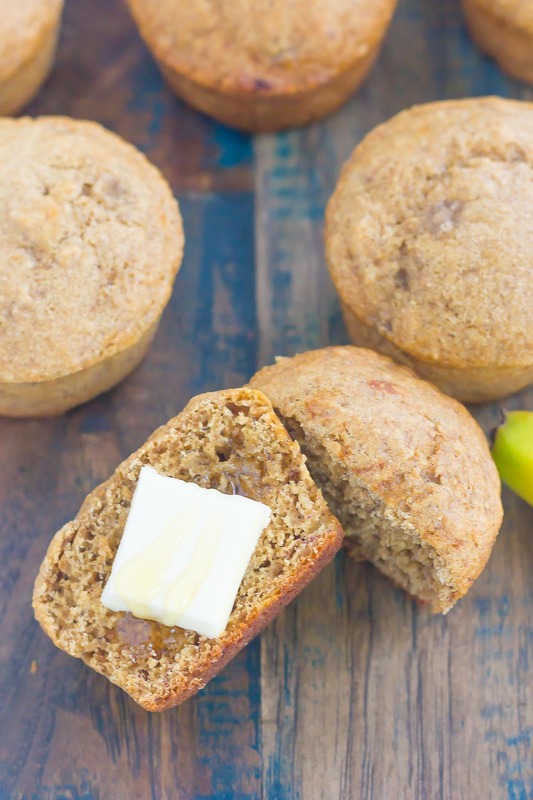 I adapted these from my Banana Chocolate Chip Muffins, which is a clear favorite around here! I love to eat this with a smear of butter and a drizzle of honey. Mmm mmm good! In a large bowl, whisk together the mashed banana, brown sugar (see note below), honey, egg, and vanilla bean paste. Stir in the almond milk, baking powder, baking soda, cinnamon and salt until combined. Add flour, 1/2 cup at a time, stirring until just incorporated into mixture. Bake for 5 minutes at 425F, then keeping oven door closed, lower temp to 350F and bake for 13-15 minutes, or until muffins are lightly browned. This oven trick helps to ensure those large bakery-style muffins. Serve with butter and/or a drizzle of honey, if desired. Muffins are not overly sweet. If you like a sweeter batter, feel free to increase brown sugar or honey by 1-2 tablespoons. I like to use vanilla bean paste in baked goods instead of vanilla extract, as it doesn't water the mixture down and provides a richer vanilla flavor. You can't beat the combo of honey and banana!! I love that these cute little beauties are healthier so I don't have to feel bad about eating.....like half the batch. LOL. Love these muffins, Gayle! Thanks, Marcie! 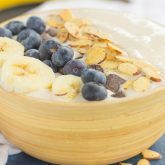 I love using the overripe bananas for baking! I love these and I'm sure my son is going to like them, too! Pinning to try them! Thanks, Mira! One of my favorites!